This is a two-day intensive course for laser tattoo removal offered on site at your clinic/salon. A flat rate fee of $4000.00 for up to 4 staff. There may be travel and/or accomodation fees applicable so contact Trudy directly for more information on pricing structure. Theory education is followed by clinical hands-on training with your Q Switched or pico second tattoo removal laser. A range of people with a wide variety of tattoos need to be available to practice your newly developing skills. A laser safety course needs to be completed before entering this course. 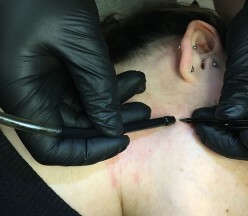 Anyone wishing to attend Laser Tattoo Removal training who does not have a Beauty/Dermal Therapy or Nursing/Medical qualification, may do so by first completing a Skin Sciences course. This course will give you the background needed to attend our courses with the intention to then set-up your own business, but may not be sufficient to gain employment with another clinic or salon. If you are wishing to set-up your own business, it is also important to first know the laser regulations for your home state. Make sure you do your research. Please contact Fleming Laser if you would like to discuss this further or have any questions. Course includes: A history and understanding of tattoos, theory of tattoo removal, Q switched laser tissue interaction, types of Q switched lasers, issues regarding tattoo ink colours and the ease/difficulty of removing ink, consultations, contra-indications, Fitzpatrick skin types, tan issues and plenty of hands-on training. There are strict pre-requisites for this course and limited numbers in the classes. Those enrolling need to have a Laser Safety certificate. Course includes: training notes, hands-on clinical training, assessment and certificate upon successful completion. Individuals wishing to enrol in hands-on courses need to have a background in medicine, nursing or beauty/dermal therapy or a similar Allied Health field. Those with no health/beauty industry background need to contact Fleming Laser directly for advice. This class is offered on Saturday & Sundays only, from the Oakleigh, Melbourne training rooms.